If ever you get injured in a car accident that was a result of someone else’s fault or negligence, you deserve compensation for any lost wages, medical expenses or emotional damage you may undergo. However, such cases usually aren’t always as straightforward. The insurance company will always be on the lookout for reasons to justify giving you a reduced settlement, or preferably none at all. Therefore, any mistake you make during and after the accident can hurt your chances of getting the compensation you deserve. 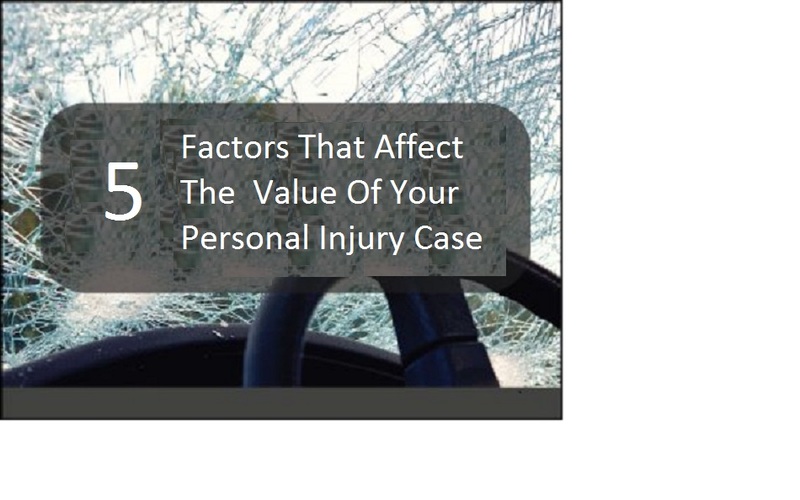 Here are 5 Factors That Affect Your Personal Injury Case which you should avoid in other to limit the chance of hurting the value of your personal injury case. Not Reporting The Accident to The Police Immediately: Involving the authorities immediately after an accident will enable you to have an official police report that will potentially help tilt the case in your favor. The police will usually take photographs of the scene and interview witnesses to the accident. The report they give will often act as evidence, and where necessary, absolve you of any wrongdoing and affirming the negligence of the other party.A police record will also document essential details about the accident that you may not be able to recall, as sometimes your memory may fail you even as little as one month after the accident. Of course, it goes without saying that you should seek medical attention immediately after the accident. How else will you prove the existence and extent of your injuries? Without a medical report from a qualified physician, chances of a non-existent case are quite high. But seeking treatment is not enough in itself; you should also follow every single instruction your physician gives regarding your treatment and attend all your medical appointments.If you demonstrate a lack of concern in getting better, the court may care less about awarding you compensation. Even something as harmless as updating your status on Facebook can affect your personal injury case significantly. You should be very careful with what you post on your social media profiles because the defense attorney will be happy and ready to use it against you in your case if need be.If you’re seeking compensation for any physical or emotional damage as a result of the accident, you can’t afford to post images that make you appear as happy and healthy as ever. Positive posts and images may discredit any claims you make in court. If possible, you should consider temporarily suspending your use of social media during the case. If that seems hard to do, you should at least maintain the highest standards of privacy including not accepting any new friends until the litigation finally ends. The insurance company may come to you early on in the process and ask you to sign different forms for this and that. Don’t fall for their trickery. Although the documents may seem unassuming, they may be banking on the chance that you will never read or scrutinize them. One simple signature can wave away your right to compensation and absolve the insurance company from any liability.If you must sign anything, it must be in the presence of your car accident injury lawyer. In any case, any qualified attorney will tell you that accepting early compensations will almost always get you a raw deal. Even when you aren’t signing documents, avoid discussing anything about the accident with the insurance company. Most importantly, never give them a recorded statement. They can trick you into admitting things that will eventually hurt your case. Any information you submit to parties involved in your case, whether to your doctor, the court or your lawyer, should be 100% accurate and true. Any false information you give will very likely hurt your credibility, and sometimes it won’t matter how solid the rest of your case is or how much evidence you have. Remember the insurance company will do their own private investigation. They will subpoena your medical records and conduct surveillance to gather every bit of information they can to weaken your case. If you get involved in a car accident, call for medical attention immediately and make sure to inform the police or relevant authorities. Avoid talking to the insurance company or making any deals in the absence of your injury lawyer. Be careful with what you post on your social media and be honest with the court, your doctor and your lawyer. Most importantly, ensure that you hire a qualified car accident injury lawyer who will ensure you receive your deserved compensation.